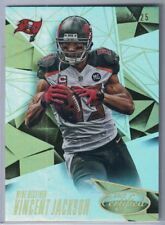 2015 PANINI PRIZM VINCENT JACKSON BLUE WAVE PRIZM, #150, #084/150, LOOK!!!!!!! CARD IS #150 AND SERIAL #'D 084/150. Team: Tampa Bay Buccaneers. Year: 2015. 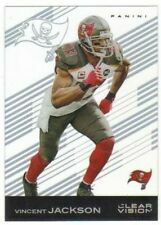 Player: Vincent Jackson. Item#: 153. SetType: Parallel. Sport: Football. Item Condition: Near Mint/Mint. Team: Tampa Bay Buccaneers. Year: 2015. Player: Vincent Jackson. Item#: 1KYCVJ. Sport: Football. Team: Tampa Bay Buccaneers. Year: 2015. Player: Vincent Jackson. Sport: Football. Team: Tampa Bay Buccaneers. Set: 2015 Immaculate Collection. Year: 2015. Player: Vincent Jackson. Team: Tampa Bay Buccaneers. 2015 Panini NFL Football Cards. Year / Season - 2015. Year: 2015. 2015 Football Cards. Set - Prizm Parallel. Player: Vincent Jackson. Manufacturer - Panini. Team: Tampa Bay Buccaneers. Year / Season - 2015. Year: 2015. Player: Vincent Jackson. Sport - Football. Each card will arrive within a soft sleeve, and a rigid toploader. Team: Tampa Bay Buccaneers. Set: 2015 Immaculate Collection Gold. Year: 2015. Player: Vincent Jackson. ===============================================. . nm-mint condition or better. Team: Tampa Bay Buccaneers. 2015 Panini NFL Football Cards. Year / Season - 2015. Year: 2015. 2015 Football Cards. Player: Vincent Jackson. Card Manufacturer: Panini Season Ticket. Manufacturer - Panini. Item#: 1KYCVJ. Year: 2015. Player: Vincent Jackson. You may have to wait to get a combined invoice if it did not combine automatically. Team: Tampa Bay Buccaneers. 2015 Panini NFL Football Cards. Year / Season - 2015. Year: 2015. 2015 Football Cards. Player: Vincent Jackson. Manufacturer - Panini. Card Manufacturer: Panini. 2015 Panini Prizm. Prizm Refractor Parallel. 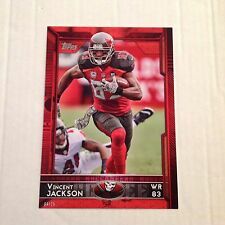 #150 Vincent Jackson. Team: Tampa Bay Buccaneers. Year / Season - 2015. Year: 2015. 2015 Football Cards. Player: Vincent Jackson. Sport - Football. Breaking cases of every new set across all major sports as well as many non-sport and even more obscure releases. ALL CARDS ARE NRMT/MINT OR BETTER UNLESS OTHERWISE NOTED. Team: Tampa Bay Buccaneers. Year: 2015. Player: Vincent Jackson. Team: Tampa Bay Buccaneers. Year: 2015. Player: Vincent Jackson. Card#: 153. SetType: Parallel.